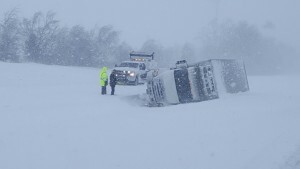 Most truckers don’t have a lot of choice about being on the roads in bad weather, however, their responsibilities when driving in bad weather are heighten when driving in adverse conditions. The Commercial Drivers License (CDL) Manual issued by the state of Kentucky requires truck drivers to decrease their speed on the road way and increase the distance between their truck and your car. In fact, the Federal Carrier Motor Administration has issued an Accident Countermeasures manual that requires certain actions to be taken by truck drivers and trucking companies prevent accidents in adverse conditions. If you’re driving near a truck during a snow or ice storm, here’s a few tips we’d like to give you to help you stay safe and avoid a big rig accident. Stay back. Take your time and keep a good distance between you and the tractor-trailer. If the truck has to stop suddenly, this will buy you time to react. Don’t ride in a big rig’s blind spot. That’s on either side of the truck. Even on a good day, a truck driver can’t see you in the truck’s blind spot. On a snowy day, with reduced visibility, it’s impossible. Be careful not to cut off a truck driver. Cutting it close and pulling over directly in front of the tractor-trailer may cause the driver to stop prematurely or swerve. Also, don’t pull in front of a truck and suddenly slow down. Pass only if it is truly safe to do so. You will feel a lot of backdraft riding beside a truck, and this can create blowing snow and low visibility. It may be best to simply slow down or stop rather than try to pass a large truck. Big rig accidents can be devastating for those in the smaller vehicle, as we’ve mentioned before. If you are involved in an accident with a tractor-trailer, call us for advice. The initial consultation is free. Contact me, attorney Kyle Roby, of English, Lucas, Priest and Owsley at kroby@elpolaw.com or (270) 781-6500.